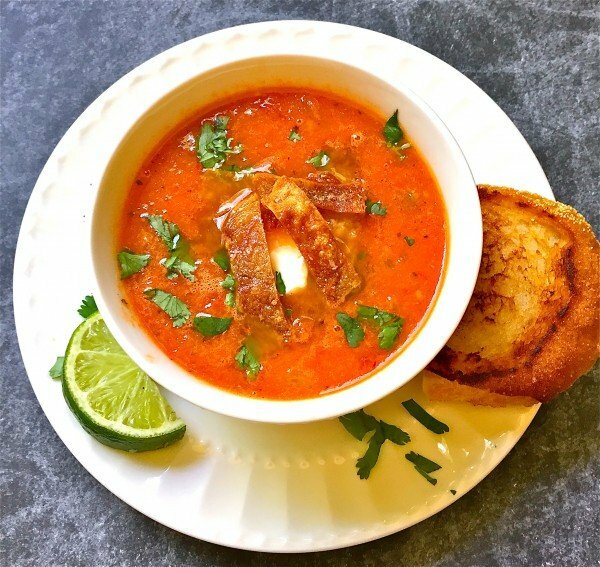 Tomato Tortilla Soup is a delicious, quick, easy, and best of all healthy answer to the “what’s for dinner tonight” question. Less than 200 calories and an excellent source of Vitamins A and C, Tomato Tortilla Soup is quintessential comfort food at its finest. Throw in a golden brown and oozing with cheese grilled cheese sandwich – now that’s a classic lunch or dinner combination! Speaking of classic, I’ve even heard of tomato soup being compared to the “little black dress”. Plain and paired with a grilled cheese sandwich, it’s a comforting lunch. But, dressed up with simple garnishes, it can be a classy start for a dinner party. I probably have at least a dozen recipes for tomato soup, but this one is by far our favorite. This silky, luscious, slightly spicy Tomato Tortilla Soup is everything tomato soup should be and more. Did you know that tomatoes were introduced into Florida as early as the 1600s? But it was almost two centuries later in 1832 when the very first tomato soup recipe was published. In fact, the first tomato soup recipes were probably just tomatoes added to basic vegetable soups. By the 1840s tomatoes were an important part of colonial Americans’ diets and they were beginning to be routinely included as ingredients in several early cookbooks. 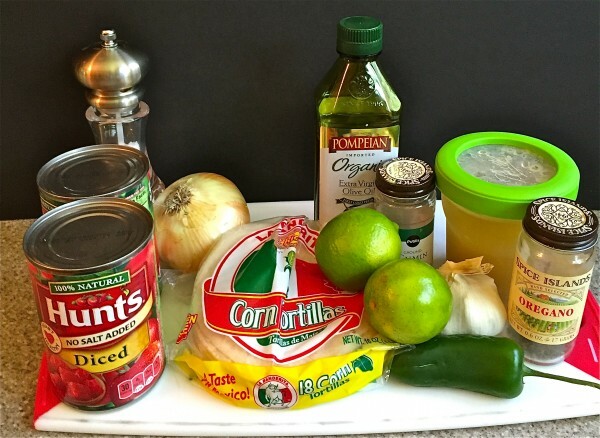 The ingredients for Tomato Tortilla Soup are: corn tortillas, olive oil, Kosher salt, onion, garlic, a jalapeno pepper, ground cumin, dried oregano, low-sodium chicken broth, no salt added diced tomatoes, fresh lime juice and for garnish, sour cream and chopped fresh cilantro leaves. To get started, heat 1 Tbsp of olive oil in a large heavy skillet over medium heat. Add the onion and cook, stirring frequently for about 5 minutes, or until it’s soft and translucent. Add the garlic, jalapeno, cumin, and oregano and cook about 1 minute more. 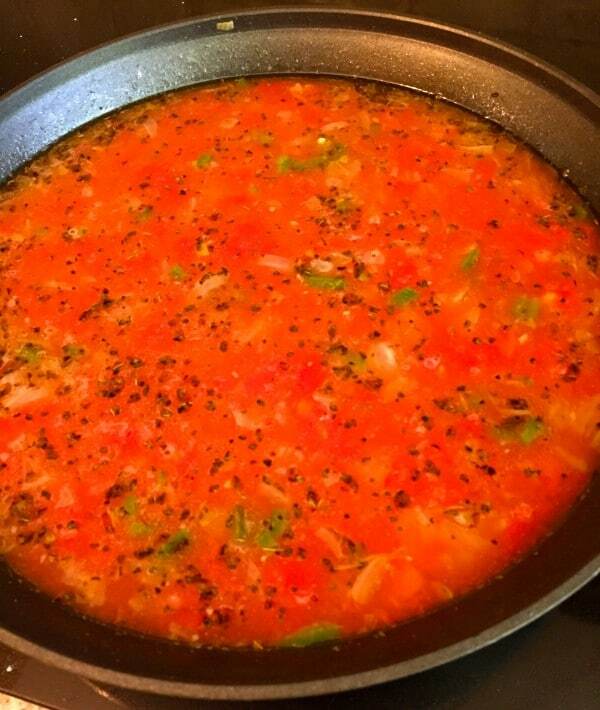 Add the chicken stock (you can substitute vegetable stock) and tomatoes and bring to a boil. Reduce the heat to low and simmer for about 10 minutes to allow the flavors to develop. While your soup simmers preheat your oven to 375 degrees. 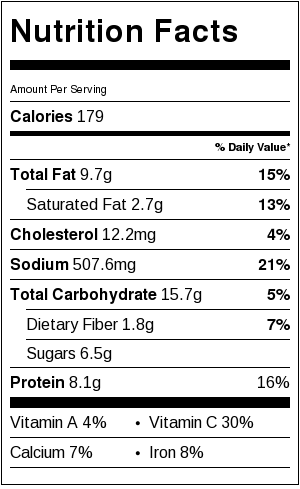 (It’s easy to make these tasty tortilla strips, but if you don’t have any corn tortillas, or just don’t want to take this extra step, feel free to substitute a handful of regular tortilla chips.) Brush each side of the tortillas lightly with the remaining olive oil. Cut the tortilla into thin strips about 1/4 inches wide. Arrange the strips on a baking sheet lined with foil, sprinkle lightly with Kosher salt and bake until crisp and golden which should take about 12 minutes. Remove from the oven to cool. When you are ready to serve the soup, remove the pan from the heat and stir in the lime juice. Taste and add a small amount of salt if needed. 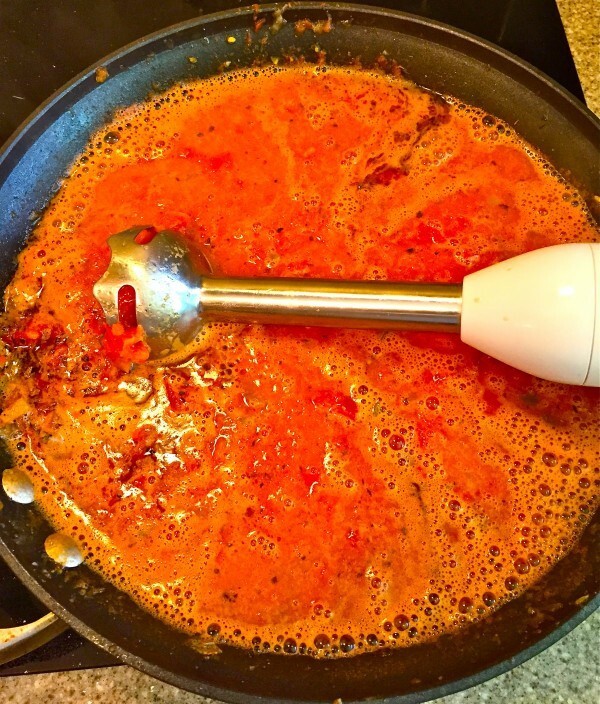 Use an immersion blender to partially puree the soup leaving some chunky tomato pieces. If you don’t have an immersion blender, you can use your regular blender, but you will have to divide the soup and process it in two batches. Also, be sure to cover the top of your blender with a folded kitchen towel to prevent any hot liquid from escaping. 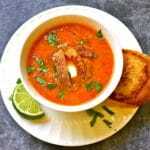 Serve the soup topped with the tortilla strips, a dollop of sour cream and a sprinkle of cilantro. Enjoy! To get started, heat 1 Tbsp of olive oil in a large heavy skillet over medium heat. Add the onion and cook, stirring frequently for about 5 minutes, or until it's soft and translucent. Add the garlic, jalapeno, cumin, and oregano and cook about 1 minute more. While your soup simmers preheat your oven to 375 degrees. (It's easy to make these tasty tortilla strips, but if you don't have any corn tortillas, or just don't want to take this extra step, feel free to substitute a handful of regular tortilla chips.) Brush each side of the tortillas lightly with the remaining olive oil. Cut the tortilla into thin strips about 1/4 inches wide. Arrange the strips on a baking sheet lined with foil, sprinkle lightly with Kosher salt and bake until crisp and golden which should take about 12 minutes. Remove from the oven to cool. 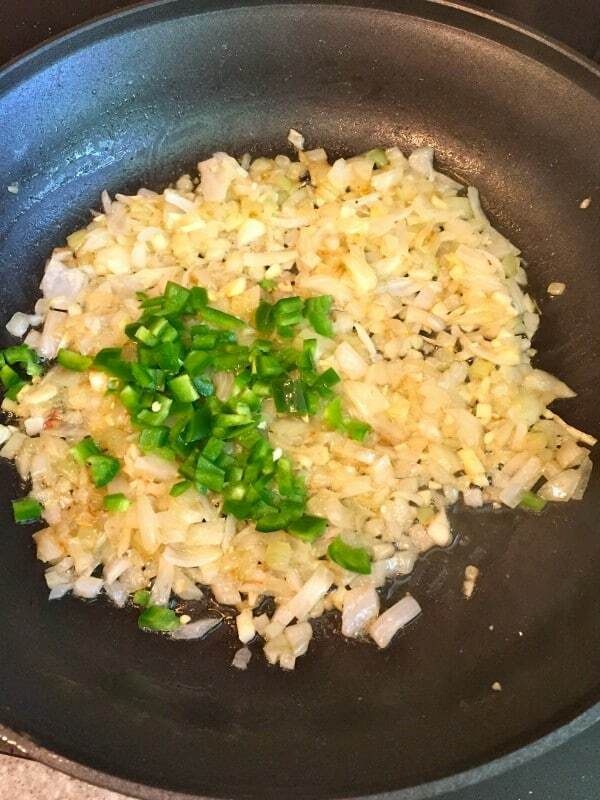 When you are ready to serve the soup, remove the pan from the heat and stir in the lime juice. Taste and add a small amount of salt if needed. Use an immersion blender to partially puree the soup leaving some chunky tomato pieces. If you don't have an immersion blender, you can use your regular blender, but you will have to divide the soup and process it in two batches. Also, be sure to cover the top of your blender with a folded kitchen towel to prevent any hot liquid from escaping.